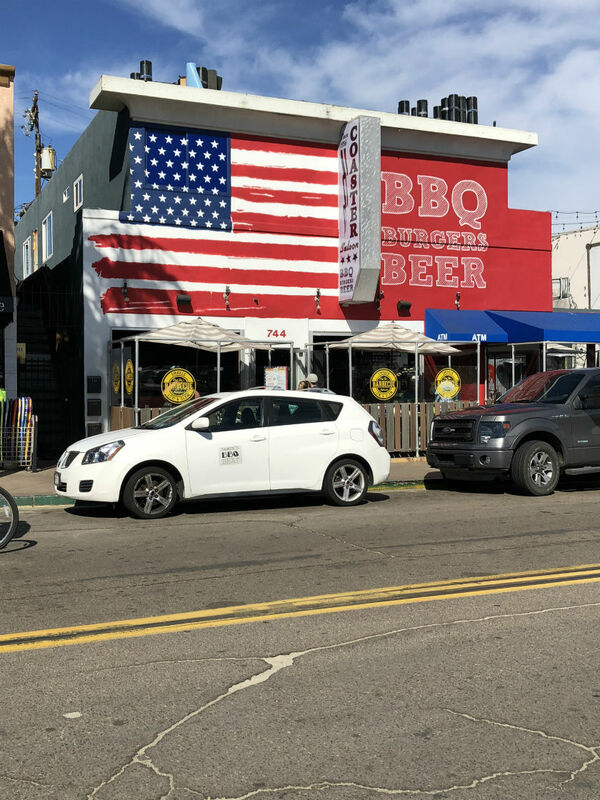 Luckily for me and many others, a new BBQ place has opened across from the roller coaster in Mission Beach just a few minutes from where I live. Coaster Saloon has been there a very long time (1956) but it ain’t what it used to be thank goodness. 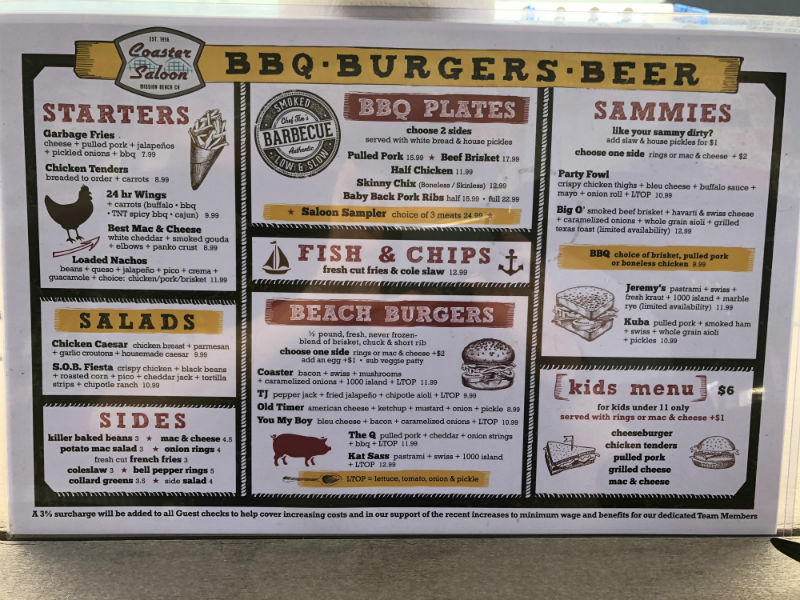 It was bought by a popular restaurant group here and they’ve completely remodeled the place and it’s a totally new menu. 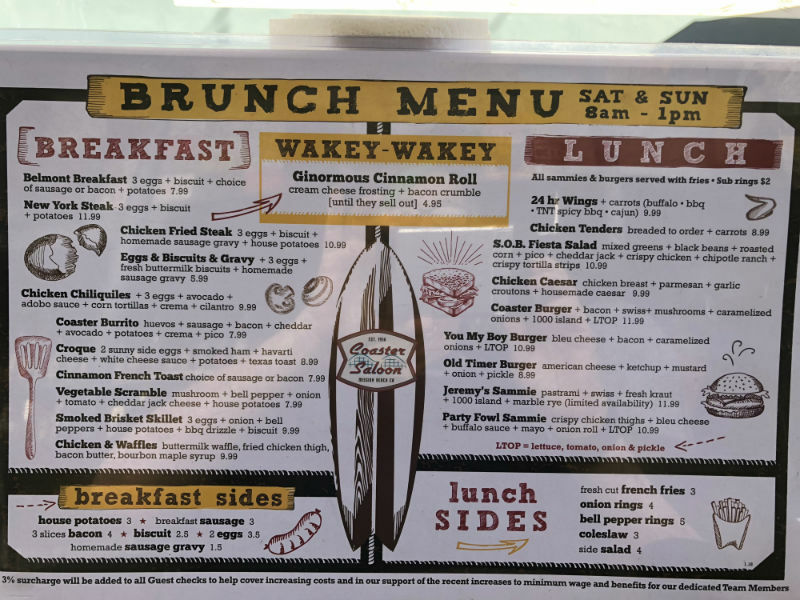 Besides serving fabulously good BBQ, their brunch menu is NOT to be missed! More on this later. Chef Tim Eyelens is the very competent chef and pitmaster here. As I’ve mentioned in so many of my reviews. I’m the rib girl and my hash tag is quite clear, #ribgirl. 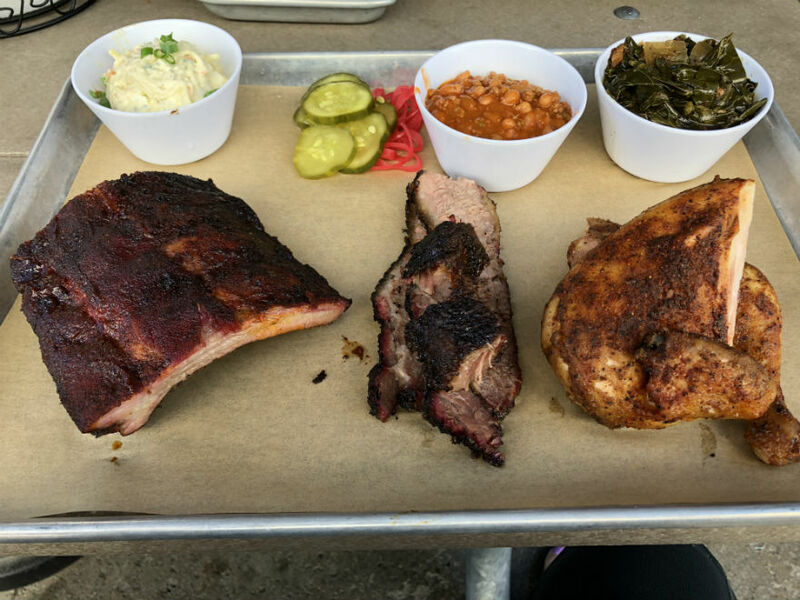 Pitmaster Tim does not disappoint on this front. Very meaty baby backs that are almost the size of spare ribs are the order of the day here. 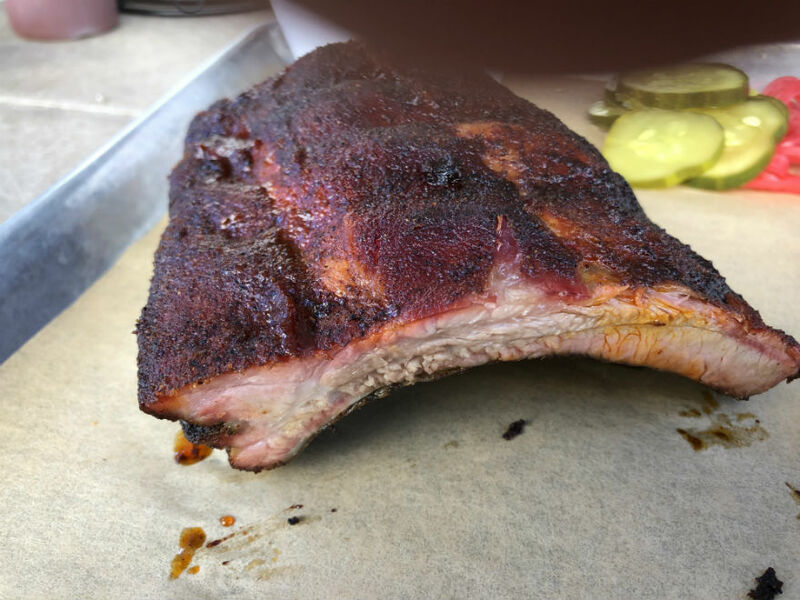 Tender and fall off the bone, just like you want them to be and nicely rubbed with some great flavors. With a rich and deeply flavored sauce baked onto them after the smoking is done. I’ve even asked them to bake a bit more sauce on there…I love that candied caramelization! His brisket did not let me down either. I do feel after eating brisket in so many places multiple times, brisket can be dried out, or very moist. I’ve had both just about everywhere. No one has a perfect record that’s for sure. That being said, I’m hoping the brisket will not disappoint you here. It has been pretty good for me. 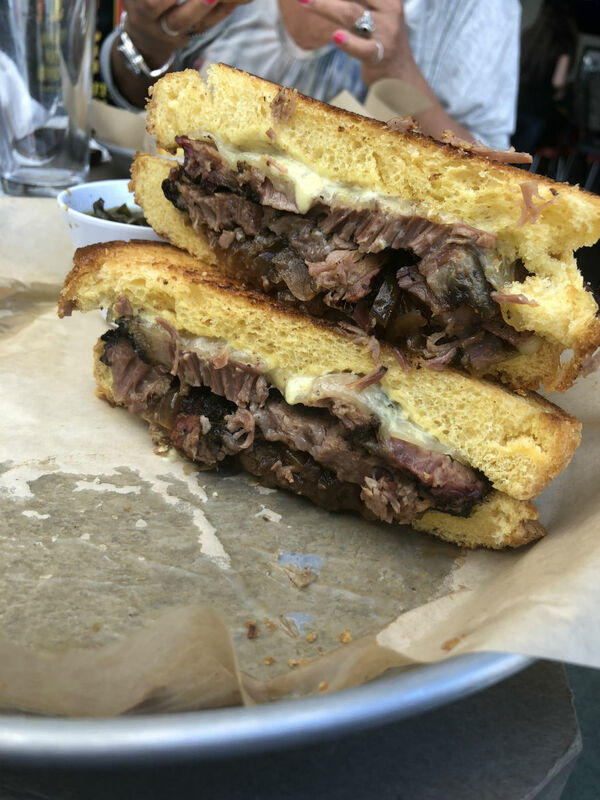 But that brisket sammie with melted havarti and Swiss cheeses, grilled onions, aioli on Texas toast……oh man!! And thankfully, his brisket is served without any sauce on it. The meat definitely shines through. His chicken is also smoked and favorably seasoned. A little behind the scenes action……. I don’t know how I can even say this, but it’s possible I may like his amazingly good chicken tenders as much as his Que! 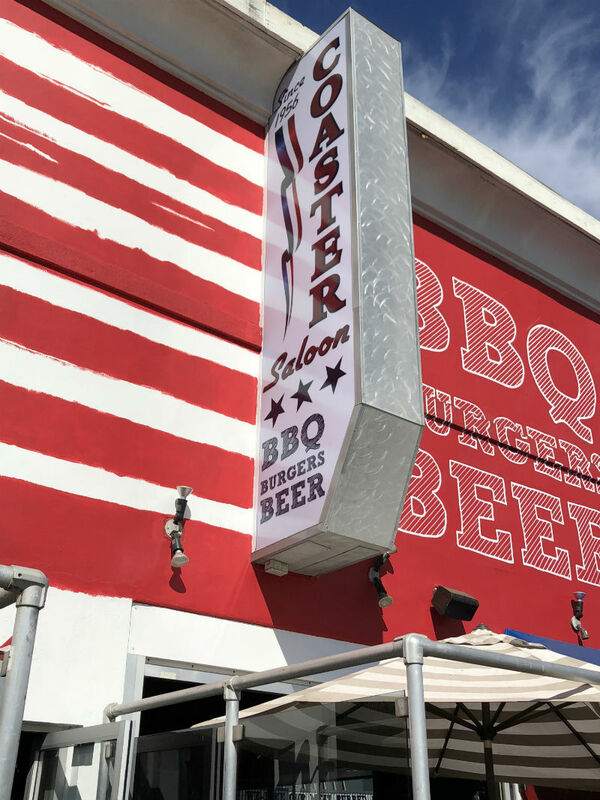 I’ve brought several of my food blogger friends and lovers of BBQ here and they’ve said pretty much the same….DAMN good tenders! His batter on them is so light and well seasoned, they’re the best. I always think this is something kids order, but do NOT miss these! Those wings are fire too! As I’ve mentioned in my other reviews, many places skip on perfecting their sides. Heck, I just talked to a fellow food blogger today who said he doesn’t care about sides. Whaaaat?! Well, I sure do! Of course the proteins come first, because I sure ain’t interested in a place just for their sides. But this is another thing given much consideration in a place that makes EVERYTHING from scratch. 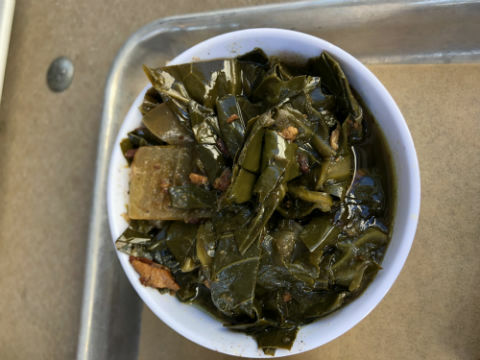 Probably the best greens (with brisket!) I’ve ever had. Right up there with Iron Pig Alehouse. 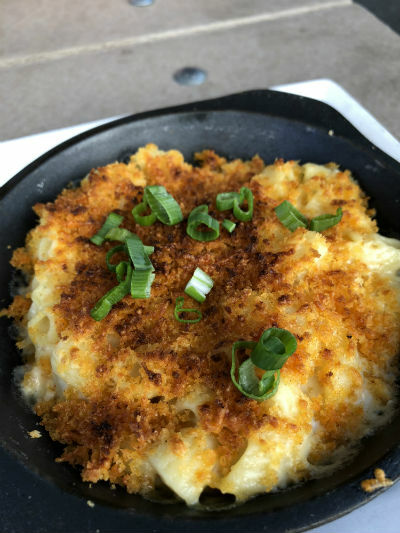 I’m not the biggest mac ‘n cheese fan, but here I’m impressed, also like I was at IPA. Beans, potato salad….no complaints here, all tasty. 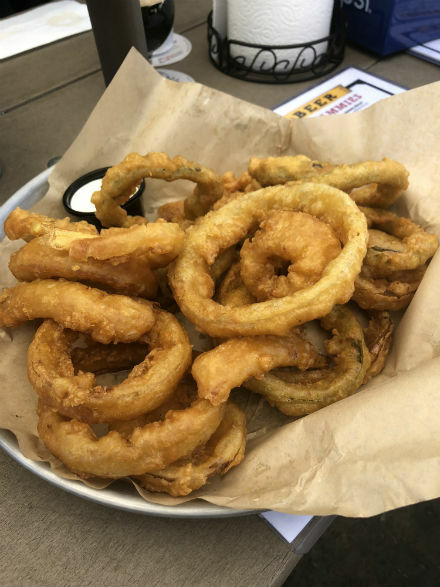 And deep fried green pepper rings…..SO good! Great onion rings too. I think you’ll be pleasantly surprised at the pricing on their menus. Now, onto their weekend brunches. 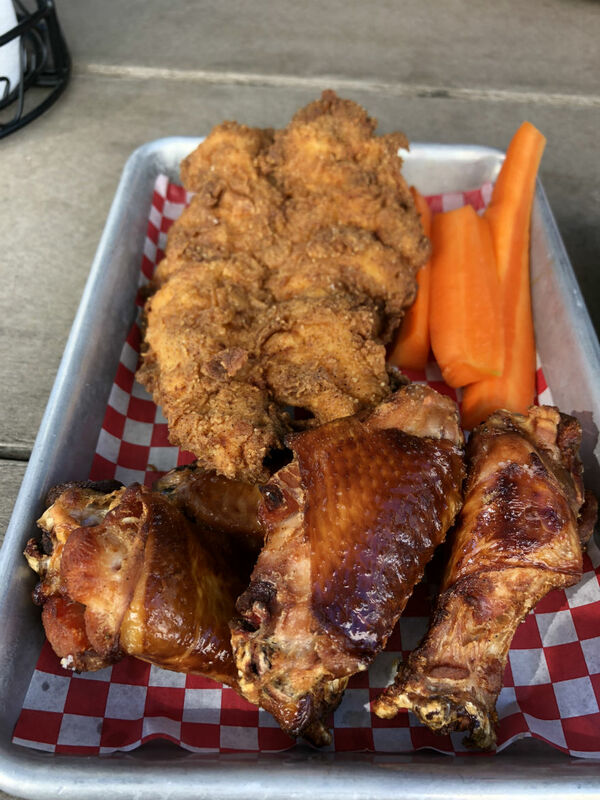 I don’t think I really know of a local BBQ place that serves both, or at the very least, does both so well. 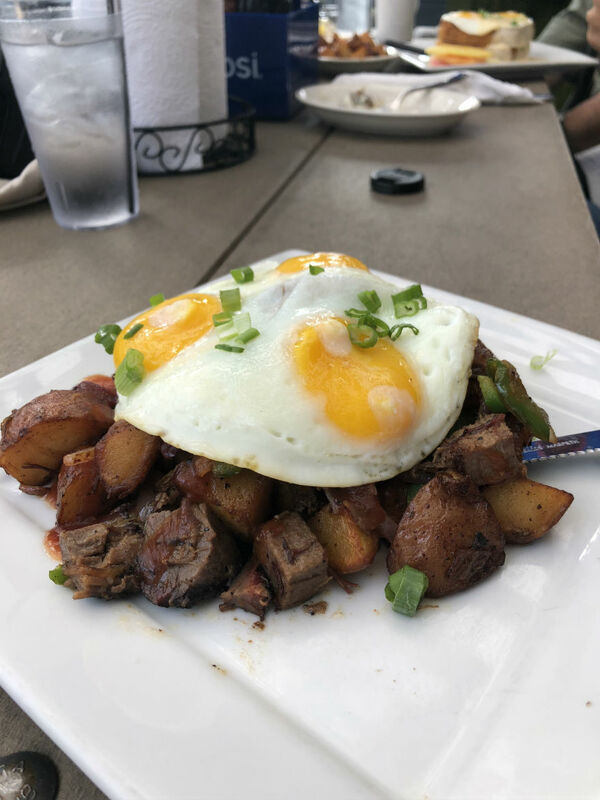 He utilizes his brisket on some scrumptious dishes at brunch. The Smoked Brisket Skillet was not only very good but a giant portion! 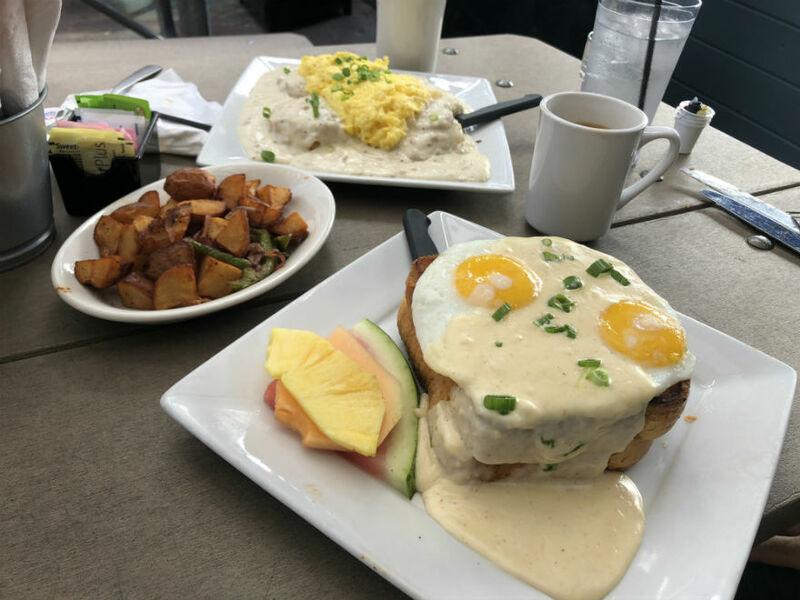 Actually, the size of all the brunch dishes are jaw dropping. Get a load of the Croque with white cheese sauce, havarti and smoked ham (on Texas toast!) and the biscuits and gravy in these pics. The potatoes are crunchy, something I’m a stickler for. 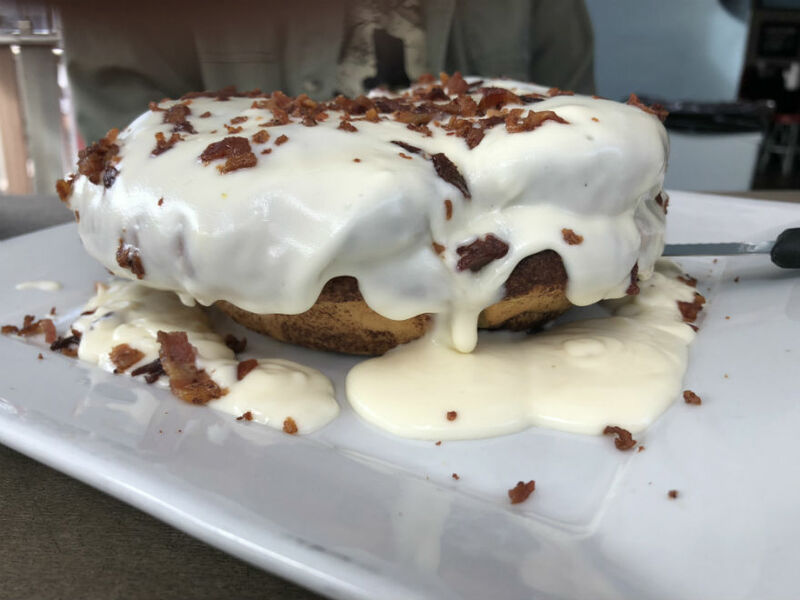 And I certainly can’t forget one of the BIGGEST cinnamon rolls I’ve ever seen……topped with what else? SMOKED BACON of course! Heaven. Full bar. They have remained an Arizona Cardinals bar, as there are still very many long time locals that hang there. Full screen TV’s everywhere to watch games. A creatively whimsical interior/patio that is a must see. Very helpful and friendly staff.